911 and The Big Reunion star Lee Brennan will make his musical theatre debut when he joins the cast of Footloose: The Musical, playing the role of Willard at the King’s Theatre Glasgow from Tuesday 7 until Saturday 11 June 2016. Lee Brennan is widely recognised as one third of multi-million selling pop group 911. One of the biggest pop acts of the 90’s, 911 were one of only five acts in the decade to achieve ten consecutive UK Top Ten Hit Singles, selling over 10 million records around the world and touring the UK four times. Lee returned to 911 in 2013, when the band reformed for ITV’s smash hit seriesThe Big Reunion. An arena tour followed, where they played to over 200,000 fans alongside acts including Five and Blue. Lee makes his theatre debut in Footloose. Based on the 1984 screen sensation starring Kevin Bacon, Footloose: The Musical tells the story of city boy Ren, who has to move to a rural backwater in America where dancing is banned. All hell breaks out as Ren breaks loose and soon has the whole town up on its feet. 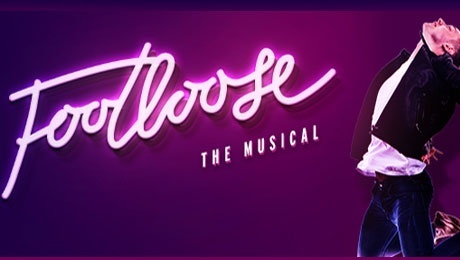 Featuring classic 80s hits including Holding Out for a Hero, Almost Paradise, Let's Hear it for the Boyand the unforgettable title track, Footloose: The Musical is set to take the world by storm once again in this brand new production, bursting with youthful spirit, dazzling dance and electrifying music. When the film was released in 1984, it became the highest-grossing February release in US film history. The soundtrack album ended the year-long reign of Michael Jackson’s Thriller at number one and went on to top album charts all over the world, eventually selling in excess of 17 million copies. Footloose was nominated for a Golden Globe, and both the title song andLet’s Hear It for the Boy received Academy Award nominations. Footloose: The Musical first opened on Broadway in 1998 where it ran for 709 performances, with a London production following in 2006, opening at the Novello Theatre following a UK Tour. Box Office 0844 871 7648 (bkg fee) Calls cost 7p per minute plus your phone company’s access charge.